Ultrabooks provided a much needed breath of fresh air to the tired laptop scene when they first made an appearance just over six years ago. Asus has been a major proponent of ultrabooks since their inception, and while there is still a perception that Ultrabooks are a pricey way of getting on the thin and light bandwagon, the likes of the ZenBook 3 continue to prove that there is a lot of great technology and performance to be had in a small form factor if you’re prepared to spend that little bit more. The latest rendition of the ZenBook 3 employs one of Intel’s newest, 8th generation quad-core processors, codenamed Kaby Lake R. Asus has combined that with a healthy amount of RAM and the latest NVMe PCIe SSD to ensure that you have performance where you need it, in a stylishly-slim laptop that you can take anywhere. Such high-end components do come at a very real cost, and the price sticker attached to this machine certainly means that it’s not a mainstream option. However, if you’re looking for a high-end Ultrabook, then this kind of ticket price isn’t too outrageous, and it genuinely does feel like you’re getting a lot of kit for you money. 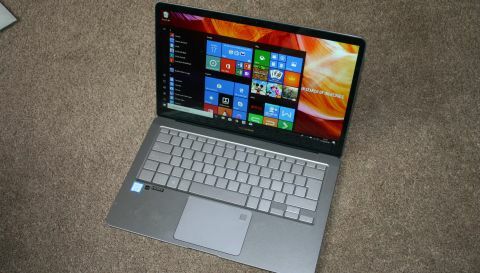 Ultrabooks do demand a premium on lesser, thicker machines, and weighing in at $1,799 (£1,399; AU$2,499), this certainly costs more than your average 14-inch laptop. Indeed, with the likes of the Microsoft Surface Book and Apple’s Iconic MacBook Pro coming in at roughly the same prices, this needs to do something special to set itself apart in a crowded landscape. It’s worth looking back at that specification though, and the model reviewed does play home to some truly cutting-edge hardware. That 512GB of PCIe NVMe storage, that we’ll come back to shortly, packs an incredible punch when it comes to data throughput, and the fact that it’s also home to an 8th-generation Core i7-8550U shouldn’t be understated either. One thing to bear in mind when looking to buy this laptop, or indeed any modern laptop, is that there are a great many specifications from which to pick from, so it’s worth drilling down into the details to make sure you’re getting the exact model you think you are. Variations on the CPU used, the amount and type of storage employed, as well as how much memory is used. In this instance, a range of CPUs can be found powering the ZenBook 3 from the latest quad-core chips as we have here, to last-generation dual-core parts. While we can see a case for using a Core i5 instead of the Core i7 we have here, we’d still recommend going for the newer generation of chips over the 7th-generation if at all possible. The model as reviewed here is readily available in the US and UK, although you need to make sure you double check the specifications to make sure. The good news for our Australian readers is that this laptop is available directly from Asus, although it doesn’t carry the exact specification that we have here, as the SSD is a slower SATA3 model as opposed to the lightning-fast NVMe drive we have in the test unit. Asus has a good reputation for its ZenBook brand, and it’s only going to win over more fans here, with its brushed aluminium finish making for a particularly fine machine to hold and use. With the lid closed, the latest ZenBook is home to a minimalist design that errs on subtle rather than boastful, with only the gold edging suggesting that this is more than it may first appear. The underside is similarly understated, with its four low-profile rubber feet providing some texture to break up the smoothness. The pair of speak grills can be found here towards the front of the machine, while a pair of thin air intakes on the edges finish off the sober aesthetic. Pop open the lid and the full-size keyboard lights up glows into action nicely in a darkened room, although in normal daytime lighting the backlight on the keys can be hard to pick out, and the lighting is a little patchy. Not a major criticism by any means, but at this level, we expect perfection, and the keyboard lighting is a little off. We found typing on this keyboard a pleasant enough experience, and for once we’re shocked to report that the trackpad isn’t a waste of time either. In fact, we didn’t feel the need to reach for a mouse when using it. There’s a fingerprint scanner in the top right-hand corner as well, for added flexibility and security. The full HD screen is a delight to use, both for serious work and for watching movies, with good vibrant colour reproduction, and great viewing angles. Those looking for a bezel-less screen are going to be disappointed, but the finish is nice and overall works well. The final point of note about the design of the ZenBook 3 is its weight. It’s light. Seriously so, but doesn’t feel weak or fragile because of it. This is an easy device to slide into its included pouch and toss into your bag, or carry around under your arm for a day. It’s slim enough to carry around as you would a file, but big enough and bright enough to present on to a small team if needed. If there’s one criticism we could level at it, the standard VGA webcam isn’t going to do anyone any favors, and in 2018 we simply expect something better. Especially when Asus are asking for such a high price for the machine.